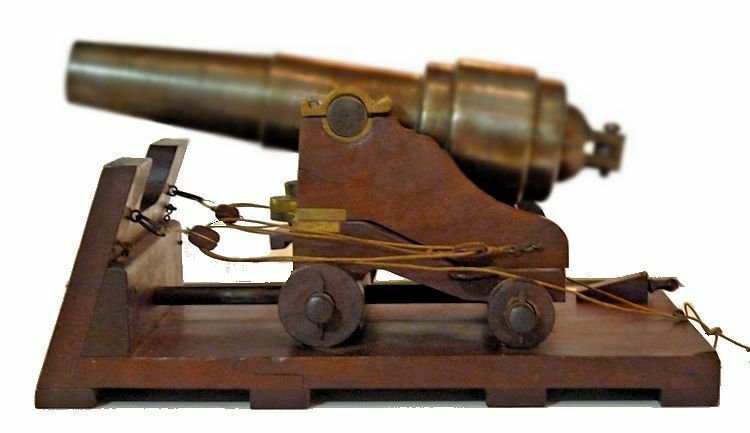 To view our current inventory of antique and vintage signal cannons, click here! The ship's carriage shown above was possibly submitted with a patent application. The high quality carriage mounted on a replica ship's deck and bulwark cutaway display complete the presentation. The barrels on the two pictures above have been blurred to emphasize the carriage. 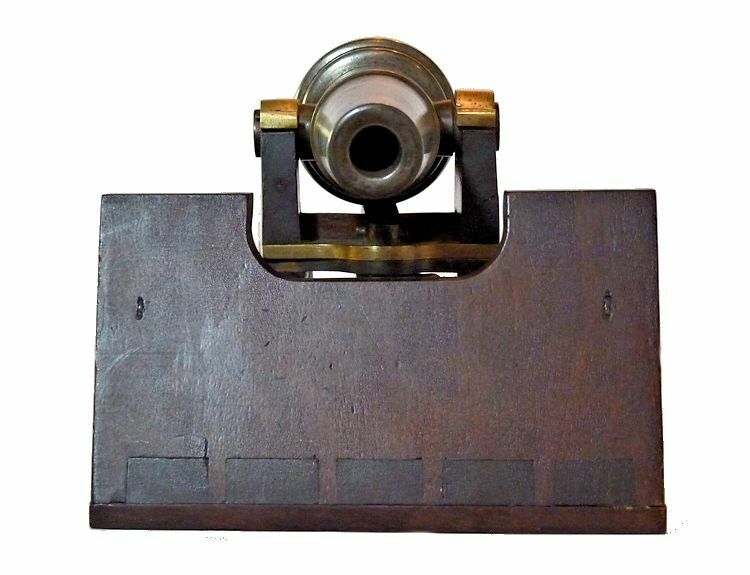 Presented is a prototype of a ship's carriage upon which is mounted an miniature iron barreled Parrot tube. The two part Mahogany carriage consists of an upper and lower section. 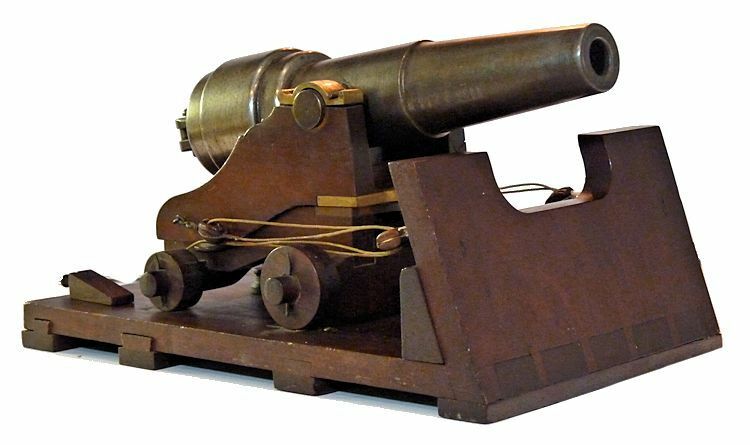 The upper section allows the cannon's barrel to traverse right and left and aim up and down. The lower section of the carriage rides on a 6 1/2" rod mounted on the deck which maintains its lateral position by allowing the lower carriage to slide in an out across the ship's beam. 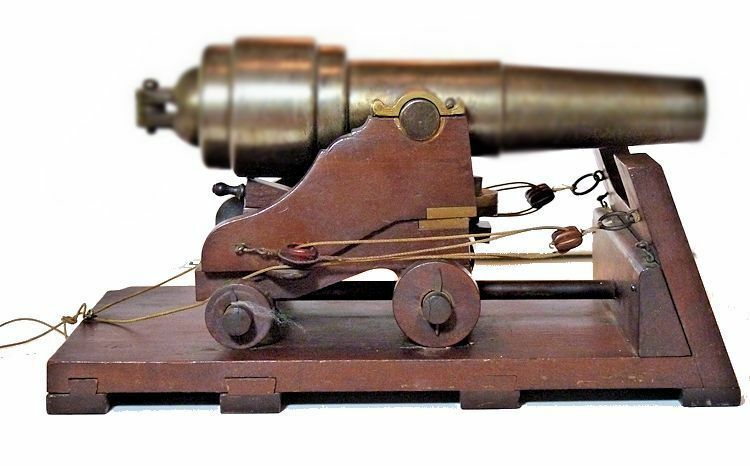 The innovations on this carriage were a giant step forward in controlling movement of a shipboard cannon. The assembly is mounted on a cutaway display replicating a ship's bulwark and deck. 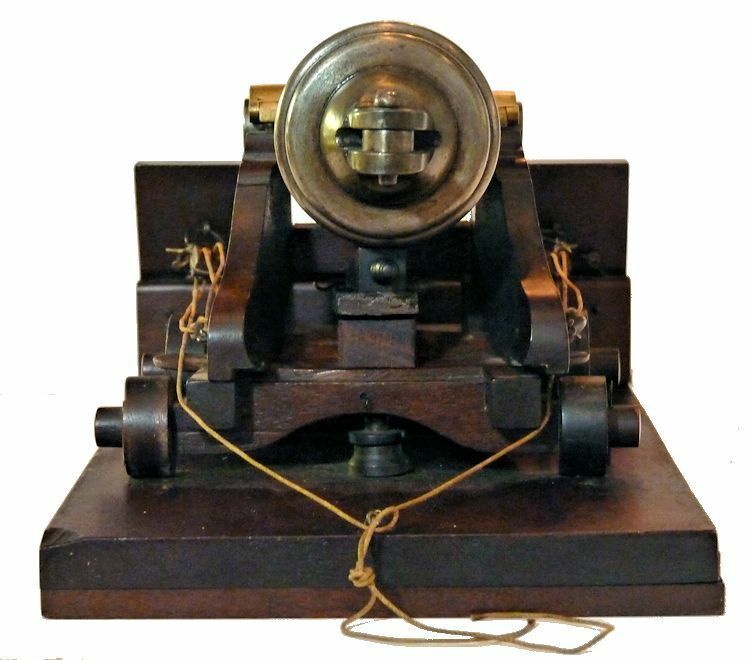 The model was possibly used in conjunction with a patent application for the carriage prior to the Civil War. The workmanship is of very high quality as is the finish. There are no foundry markings on this example which is not unusual. There is a small touch hole above the rear chamber, but no attempt should be made to fire it. The original carriage and cutaway display are made from Mahogany and Walnut. The woods have almost all of their original finish remaining. The carriage is fitted with the customary blocks and tackle for use on a ship. 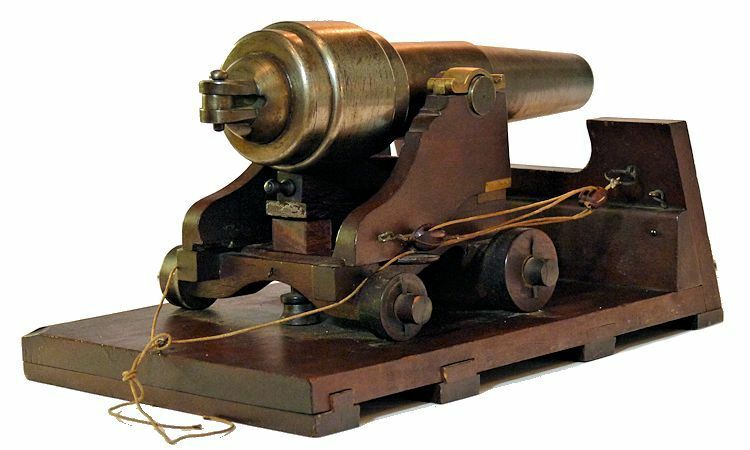 Maximum diameter of tube 1 1/2" At 1st ring 1" Weight of cannon 7 lbs. 9 oz. ACCESSORIES: 4 1/4" x 7/8" x 1/4" Walnut plank with single transverse groove. 1 3/4" long Walnut Aiming block with handle. 3/4" x 1/2" x 1/2" rectangular Mahogany block. 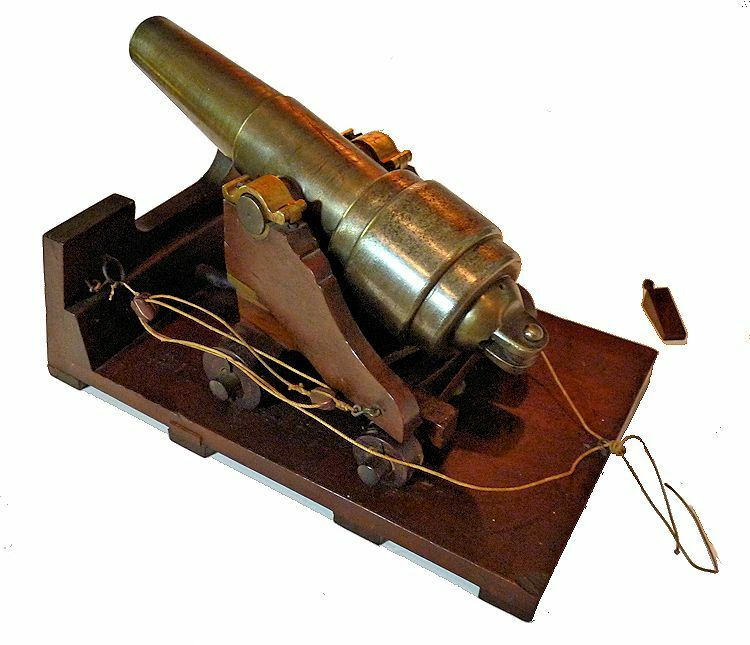 PROVENANCE: The cannon comes from a large private collection of cannons and was acquired in the normal course of business. CONDITION: The the turned steel barrel has an applied bronze finish which is worn allowing the patinized steel to show through making a very handsome appearance. 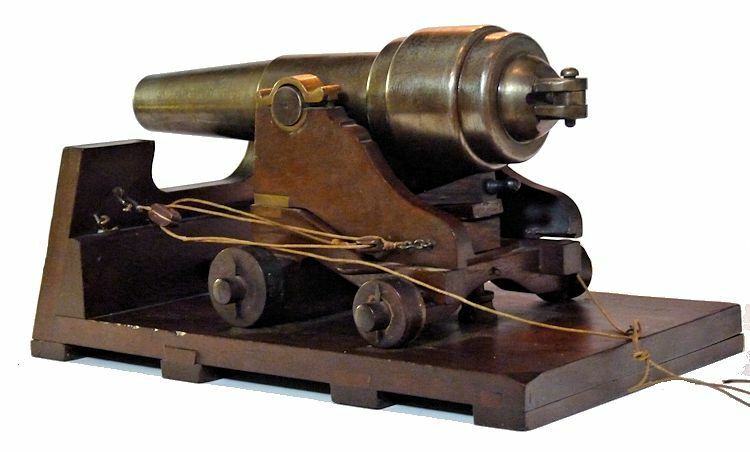 Its two large trunnions are centered on the tube and held by two heavy cast trunnion caps. The touch hole at the top of the breech enters the tube on a slant, but we can not be sure that it goes through to the bore because of its small diameter. The tube is in sound condition and shows no evidence of being fired. The carriage is made of Mahogany and there is a small old crack at the top left front of the upper half which is designed to traverse above the lower carriage which has a front and rear axle, each with two wood wheels. The center of the lower carriage has a 6 1/2" rod that runs from the bulkhead to a point two thirds the width of the deck. 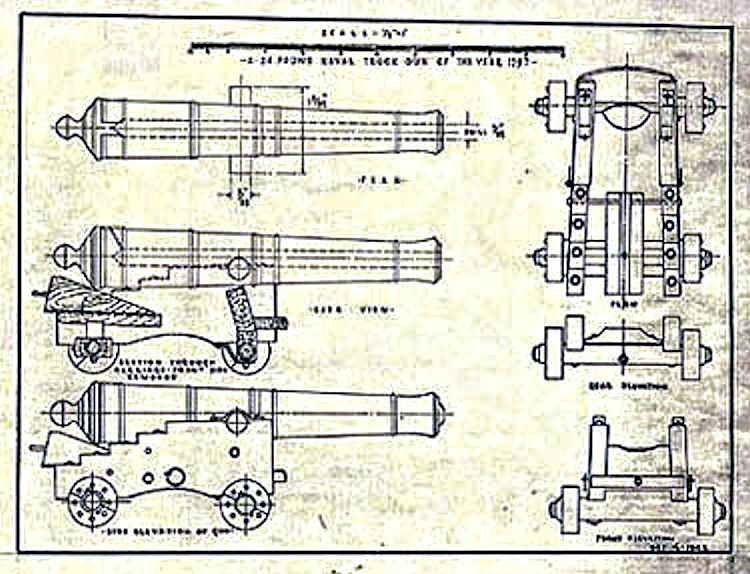 Hence, the entire cannon moves straight in and out from the bulkhead and cannot slide to either side as it would using a carriage of normal design. The bulwark and deck may be made of Walnut. There are some other minor marks of age as expected. There are no maker's marks or inscriptions.